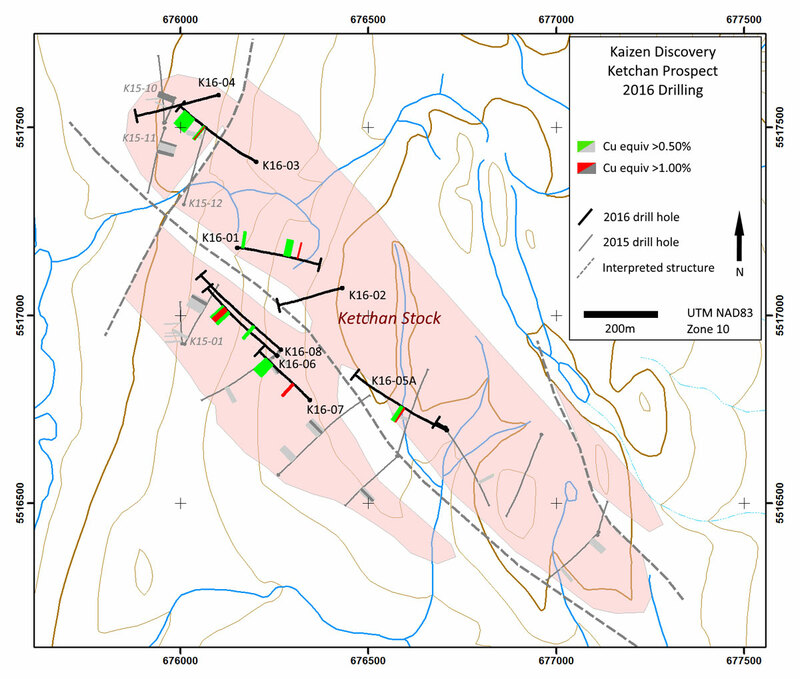 VANCOUVER, CANADA – Kaizen Discovery announces drilling results for its eight-hole, 4,009-metre 2016 drilling program at the Ketchan porphyry copper-gold prospect at the Aspen Grove Project in southern British Columbia, Canada. 8 metres grading 1.29% copper and 0.84 g/t gold (2.05% copper-equivalent) in drill hole K16-07, and 60 metres grading 0.36% copper and 0.15 g/t gold (0.50% copper-equivalent). The 2016 drilling program was directed towards expanding known zones of mineralization and testing undrilled areas within the Ketchan Stock. All holes intersected potassic or calc-potassic alteration and all but one returned intervals of copper and gold mineralization. Mineralized intervals cited above represent apparent, not true widths, as true widths are not known. 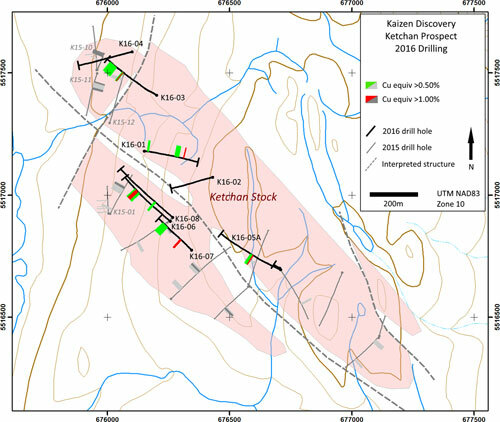 "While the exploration results to date do not support the probability of a near-surface, open-pittable copper-gold deposit at the Ketchan prospect, our recent drill holes K16-06 and K16-07 intersected structurally-controlled higher-grade copper-gold mineralization at depth, the significance of which remains to be determined." said Eric Finlayson, Interim CEO. The Ketchan alkalic porphyry copper-gold system is hosted by the Ketchan Intrusive Stock, a dioritic to monzonitic intrusion at least 1,800 metres by 500 metres in size. Drill holes completed by Kaizen in 2015 and 2016 have intersected low-grade copper (chalcopyrite and/or bornite) mineralization, often accompanied by gold, across the known length of the intrusion. Throughout the Ketchan porphyry system, moderate-to-strong magnetic anomalies and weak-to-moderate chargeability anomalies are associated with the strongest mineralization. Drill holes K16-01, K16-02 and K16-05A were designed to expand the mineralized system in the northeastern lobe of the Ketchan Stock. K16-01 intersected 170 metres of hydrothermal breccia with several low-grade mineralized intervals. K16-05A intersected an interval of 8 metres of 0.68% copper and 0.45 g/t gold within a wider interval of 36 metres of 0.43% copper and 0.21 g/t gold. Drill holes K16-03 and K16-04 tested the northwestern margin of the exposed Ketchan porphyry system, where 2015 drill hole K15-10 intersected 26 metres of 1.05% copper before being abandoned in a fault zone (see Kaizen press release, November 3, 2015). Drill hole K16-03 was successful in locating narrow mineralization of similar character, intersecting two metres of 0.94% copper and 1.75 g/t gold from 338 to 340 metres. These high-grade mineralized occurrences are separated by more than 150 metres and are hosted by a unique monzogabbro phase of the Ketchan Stock. Drill holes K16-06 and K16-08 were designed to follow up on high-grade surface samples and on mineralization in hole K15-01, which intersected 266 metres of mineralization from surface including 78 metres grading 0.50% copper and 0.15 g/t gold (see Kaizen press release, July 20, 2015). K16-06 intersected similar mineralization to that in K15-01 and included the 28-metre, higher-grade interval reported above. K16-08 was drilled to confirm the continuity of higher-grade mineralization but failed to encounter the zone. Drill hole K16-07 targeted a weak-to-moderate chargeability anomaly with a moderate magnetic response. The hole intersected a shallow high-grade interval of 8 metres of 1.29% copper and 0.84 g/t gold from 121 metres depth, and a deeper broader interval of 60 metres of 0.36% copper and 0.15 g/t gold from 278 metres depth. Jim Logan, P.Geo., an independent geological consultant with extensive alkalic porphyry experience, and formerly with the British Columbia Geological Survey, was retained by Kaizen to construct a holistic geological model for the Ketchan prospect. Mr. Logan's work included re-logging of drill core, lithogeochemical sampling and thin section petrographic study and has highlighted new controls to copper-gold mineralization on the property. * Width refers to drill-hole intercept. True widths have not been determined. Figure 1. Location of the Ketchan and Par prospects at Kaizen's Aspen Grove Project. Figure 2. Interpreted geological features of the Ketchan Stock, with 2016 and 2015 drill holes indicated. The Aspen Grove Project is located in southern British Columbia, near the city of Merritt. The project is approximately 112 km2 (11,237 ha) in area and covers part of an extensive belt of porphyry copper-gold mineralization hosted by Early Triassic Nicola Group volcanic rocks and Late Triassic to Early Jurassic intrusions. Title to the Aspen Grove property is held by KZD Aspen Grove Holding Ltd., a subsidiary owned 60% by Kaizen and 40% by ITOCHU. 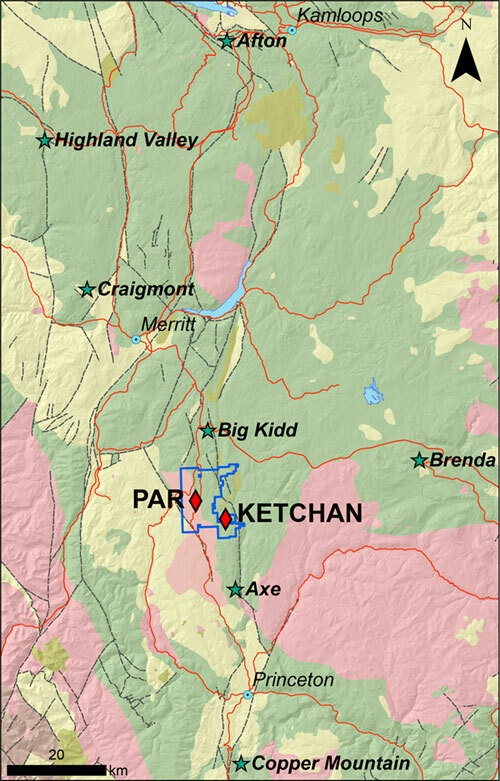 Three claims (13.75 km2) at Aspen Grove outside of the Ketchan prospect area are subject to a 2% net smelter return royalty, 1% of which can be purchased at any time for $3.0 million. Kaizen's disclosure of a technical or scientific nature in this news release for the Aspen Grove Project has been reviewed and approved by Nils Peterson, M.Sc., P.Geo., a geological consultant for Kaizen, who is a Qualified Person as defined under National Instrument 43-101. Mr. Peterson is not independent of Kaizen for purposes of NI 43-101. Drill-core samples (2-metre sample length) for the Aspen Grove Project were prepared at Kaizen's core logging facility in Merritt, BC, and samples were shipped to ALS Minerals' preparation lab in Kamloops, BC. Ketchan samples were analyzed at ALS's ISO 17025:2005-certified North Vancouver laboratory for gold, platinum and palladium by fire assay and ICP-AES and for 35 elements, including copper, molybdenum and silver, by ICP-AES using an aqua regia digestion. Overlimit (>1%) copper analyses also were completed by ICP-AES with aqua regia digestion. Core intervals cited above represent apparent, not true widths; true widths are not known. Assay intervals above have been calculated with no cutoff value. Blanks, standards and duplicate samples were inserted regularly into the sample sequence with a ratio of approximately one QA/QC sample out of five. The 2016 Aspen Grove drilling program and sampling protocol was supervised by Nils Peterson, M.Sc, P.Geo., a geological consultant for Kaizen. Mr. Peterson has verified the Aspen Grove data disclosed in this news release.